The TELDE kennel Prefix / Affix was founded over 40 years ago. Having always loved Boxers this is the breed I wanted to have when I came to live in Australia from the U.K. when I was a child. There weren't any available here at that time, so a Dalmatian was brought instead and that started my love affair with breeding and exhibiting dogs over 50 years ago. Over this time I have had various breeds, some belonging to my children who use to handle with and for me. But my greatest interest has been with American Cockers which I bred and exhibited very sucessfully for many years breeding and or owning approximately 25 champions. I have had my greatest success exhibiting and breeding with my American Cockers with winning many Best in Show Specialties, Best in Groups, Runner Up in Groups, Classes in Shows & Group. To this day I still love watching the American Cockers being exhibited, and looking at the new imports, while trying to keep up to date with the breed in general. And still always having 1 or 2 of my precious Dalmatians and Boxers by my side. 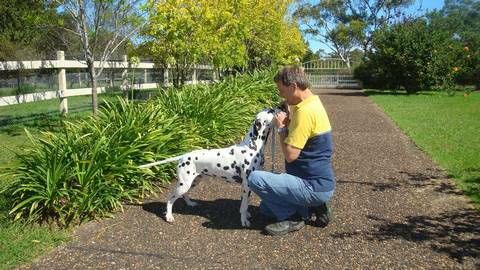 TELDE DALMATIANS & BOXERS place a great emphasis on breeding puppies and adults that are sound in health, temperament and structure.